Theological interpretation (an old concern 'round these parts) is here to stay not because it is new, but because it is normal. One of the testimonies to its normality is the abundant evidence for the method in art history. A hot-headed art historian might even go so far to say that theological interpretation of the Bible is primarily a visual phenomenon, in the sense that it constitutes the earliest form of Christian art, and that art is a remarkably more immediate and effective way of "spiritually" reading the Bible. Consider, for example, Jesus appearing to Job on the right. This is less known than it should be, but one sees the marks of a rising academic stock worth investing in now. An intriguing session at the Society of Biblical Literature in Chicago this year thoroughly scratched the surface of this enormous topic. There, one contributor wisely suggested that "visual criticism" should be added to the more familiar repertoire of redaction, comparative, or canonic criticism of the Bible. Though some scholars consider this kind of thing "Bible criticism on holiday," such scholars themselves seem to have been on holiday, failing to notice that the De Gruyter's Encyclopedia of the Bible and Its Reception includes a visual arts section (to which I've contributed), and Blackwell's "through the centuries" commentary series is incorporating visual art as well, not to mention a growing number of studies, and an Emory University postdoc to boot. So let me throw down here: Criticize historical criticism all you want, but if your interpretive method still unthinkingly limits itself to text, you're still beholden to the historical critical paradigm. There is little discussion of visual exegesis in evangelical circles, despite the exciting talk surrounding theological interpretation (so well introduced by Dan Treier). However, one could suggest that the phenomenon first happened visually in the evangelical arena as well, as evidenced by Bruce Herman's typological paintings made in collaboration with the Old Testament scholar Gordon Hugenberger, on offer long before theological interpretation caught on more widely. All this is by way of bringing up the current issue of Comment, edited by Peter Leithart (who has written in this area himself). 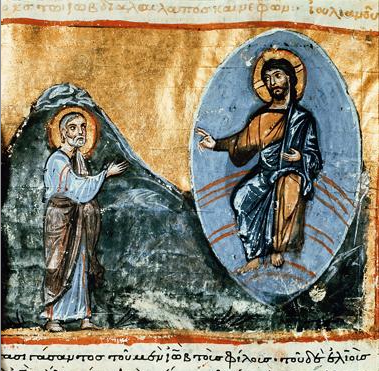 Therein your humble scribe has penned an introductory article to the phenomenon of visual exegesis, concluding with a meditation on what is probably the most interesting Byzantine fresco I've ever seen. To poke fun at the Anchor Bible commentary series (that bastion of historical criticism), the article is entitled "Anchors Aweigh! The Neglected Art of Theological Interpretation." 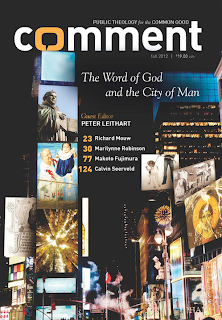 If that's not enough of a motivation to purchase the issue, consider the lineup of contributors, including Marilynne Robinson, my colleague Lynn Cohick, Matthew Lee Anderson, Dan Siedell, Mako Fujimura, and other worthies. It's more like a book than a magazine actually, and definitely worth ordering (but I'm biased).